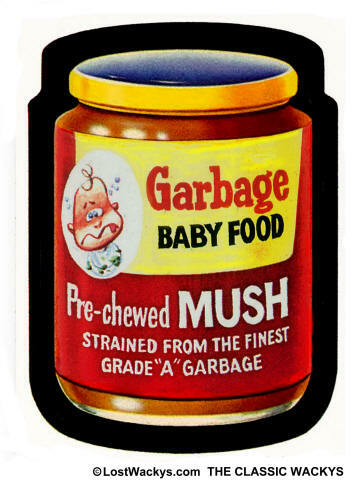 Garbage Baby Food never got to be a sticker, but if it had, maybe it would have looked like this. Twenty five of the 1973 2nd Series stickers were based on the 1969 Wacky Ads. Garbage Baby Food was repainted for the 2nd series as Gurgle Baby Food. We don't know why the name was changed. Did Topps think "Gurgle" was funnier, or less offensive toward Gerber? Or did Tom Sutton change it on his own, since he was also painting Wacky Garbage during this time?